A new PBS music program promises no Celtic nothing…but gives you Train instead. Who has failed? PBS has a spotty record when it comes to music programming. For every SoundStage presentation they might have in their back pocket, they have at least seventeen “high quality” performers they pulled out of podunk church choirs, potato farm fields, and heaven knows where else, and makes them stars for as long as the pledge drive runs. In a month’s time, these celebrities drop off the face of the earth. And then there are the package programs, shot during oldies tours where certain generational groupings are formed, and the bands of old get to count (usually on one hand) how many original members are actually taking part in this one-of-a-kind celebration, or still breathing, as the case may be. So the limbo bar for PBS tends to be not too difficult to maneuver. An upcoming series for the network, however, gets a little bit farther into the interest department even though the majority of the acts that shall participate are also now considered “legacy” artists…and there’s also Train. The series nonetheless looks like it could be interesting, even with Train. I shall now go boil my fingers for having typed that. Front Row Center, a new music television series that brings the live concert experience home, is scheduled to debut its inaugural season on public television stations across the country beginning April, 2012 (check local listings). For the premiere season, Front Row Center boasts an incredibly diverse musical line-up that spans genres and generations. The Grammy-winning, multi-platinum selling, chart topping group represents a unique set of industry power players that includes The Beach Boys; Train; Phil Collins; The Secret Sisters featuring T-Bone Burnett, Elvis Costello and Jakob Dylan; Colbie Caillat; Moby; Cheap Trick; O.A.R. ; and Richard Marx. April 12: Colbie Caillat: Armed simply with her dusky vocals and acoustic guitar, this episode highlights her homespun music. In this performance, she sings her first hit single, “Bubbly,” as well as the love-stricken “Realize.” Caillat continues to impress with her sweet lyrics in “Fallin’ For You” and falls back in love when she performs “I Never Told You.” One hour. April 26: Train: The Grammy Award-winning California rock band celebrates their fifth album, Save Me, San Francisco with highlights including “Hey, Soul Sister,” “If It’s Love,” and “Marry Me,” as well as past hits “Drops of Jupiter” and “Calling All Angels.” One hour. May 3: Moby: This multi-talented and eclectic performer showcases his wide range as a musician and songwriter in this one-of-a-kind performance. With assistance from gospel belter Inyang Bassey and torch singer Kelli Scarr, Moby uses this hour of television to survey his nearly 20-year career. Highlights include “South Side,” “Porcelain,” “Natural Blues,” and “Why Does My Heart Feel So Bad.” One hour. 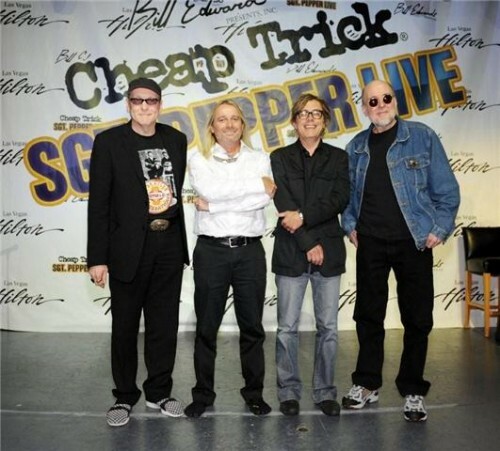 May 10: Cheap Trick: Well known for their four decades of almost non-stop touring and new music, the group combines their famous power pop and melodic sounds as they rock out in this special concert. Seventeen studio albums under their belt make for so many great songs including favorites like “Surrender,” “Dream Police” and “I Want You to Want Me.” One hour. May 17: O.A.R. : From their roots as a high school band to selling out New York City’s Madison Square Garden in 2006, the band has reached new heights of popularity, releasing six studio albums and one live album. Known for their impressive live shows, O.A.R. showcases their hits like “Shattered (Turn the Car Around),” as well as “Crazy Game of Poker” and “Love and Memories.” One hour. May 24: Ben Harper and Relentless7: Blues, soul, folk, reggae, and rock music come together when Ben Harper and Relentless7 take the stage. With his lap steel on hand, the two-time Grammy Award winner performs a set of raw, heartfelt songs including “Steal My Kisses” and “Diamonds on the Inside.” One hour. May 31: Richard Marx: A Night Out with Friends: For more than two decades, Richard Marx has made an indelible mark on the music community with more than 30 million records sold, and 13 #1 singles, and remains a radio fixture radio as an artist and producer working with some of the biggest names in the music business. In this concert, Marx takes us through his legendary career and brings along a few friends including Tony Award winner Hugh Jackman and former ‘N Sync lead singer JC Chasez. One hour. June 7: The Beach Boys: Summer’s Gone: The legendary group reunite to celebrate their 50th anniversary (2012) with a look back at their career featuring never-before-seen archival concert footage, plus songs from their new album. 90 minutes.